Philippines Foreign Minister Perfecto Yasay told the United Nations on Saturday his country’s new president, Rodrigo Duterte, had an “unprecedented” mandate and the world should not interfere in his crackdown on crime. 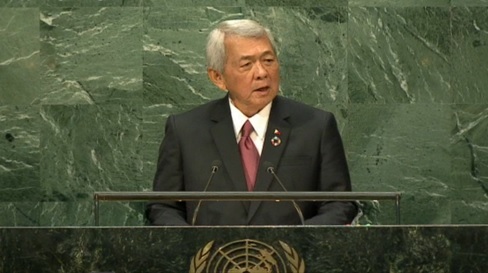 Addressing the annual U.N. General Assembly, Yasay said the Duterte government was “determined to free the Philippines from corrupt and other stagnating practices, including the manufacture, distribution and use of illicit drugs. “Our actions, however, have grabbed both the national headlines and international attention for all the wrong reasons,” he said. Duterte won a landslide election victory on May 9 after vowing to wipe out drugs and crime. Police said this week that in the past 11 weeks, nearly 3,000 people had been killed in Duterte’s war on drugs, a figure adjusted from the 3,800 they cited last week. The killings have drawn widespread international criticism, including from the United Nations, drawing angry responses from Duterte. On Thursday, the Philippine leader hurled insults at U.N. Secretary-General Ban Ki-moon and the European Union, then invited them to come to investigate his crackdown. Yasay said Duterte had won “an unprecedented and resounding electoral mandate” and now enjoyed a 92 percent approval rating. As such, he had to deliver on a “sacred” call for change. Duterte’s defiance of high-profile organizations and his insults of anyone from U.S. President Barack Obama to the pope have amused many Filipinos, but worried foreign governments – not the least the United States, which sees Manila as a vital partner in Asia in the face of a rising China. Some analysts predict Duterte will seek to diversify foreign relations beyond Washington, including by seeking better ties with erstwhile maritime foe China. At the same time, he said Manila would remain “a responsible partner of the international community,” committed to the rule of law – including an international court ruling this year in favor of the Philippines and against China over competing claims in the South China Sea.